so in fact Mongo connection is configured in META-INF/resources.xml file and thanks of TomEE we can refer it as any standard resource. If you are going to use other application server you can change this approach to the one provided by it, or if you want you can use DeltaSpike extensions or your own method. Also because MongoClient database is get from a method annotated with @Produces you can be injected it wherever you want on your code, so you can skip the abstract services layer if you want. WARNING: I am not an expert of Spring Boot. There are a lot of things that I find really interesting about it and of course that can really improve your day-to-day work. Moreover I don't have anything against Spring Boot nor people who develop it or use it. But I think that community are overestimating/overvenerating this product. Spring Boot makes it easy to create stand-alone, production-grade Spring based Applications that can you can "just run". And it seems that this thing has just revolutionized the Java world. As you can see the magic happens inside SpringApplication class which starts an embedded Tomcat or Jetty and using Spring thing it registers this controller. Pretty impressive I know with a few lines you can have an endpoint ready to be used. But I wonder to myself if it is possible to use the same approach in JavaEE world and with the same low-level and light requirements. And the answer is absolutely. I have just created a really small protoype/proof-of-concept to prove that it is possible. Also please don't misunderstand me, Spring boot offers a lot of more things apart from self-contained application like monitoring, actuators, or artifact dependency resolution. But these things are only integration with other technologies, my example has been developed from zero in 1 hour and a half so don't expect to have a Spring boot ready to be used. The first thing to choose is the application server to be used, and in this case there is no doubt that the best one for this task is Apache TomEE. It is a certified web profile Java EE server which takes 1 second to start up and works with default Java memory parameters. So I added tomee dependencies in my pom.xml file. In used tomee embedded version (1.7.1) you can only deploy applications contained inside a file, you cannot add for example a Servlet programmatically like it is done in Tomcat. This may change in near future of embedded tomee API, but for now we are going to use ShrinkWrap to create these deployment files in a programmatic way. As you may see it is really simple piece of code and for example configuration or name of the application is hardcoded, but see that with several small easy changes you may start configuring server, application and so on. In summary, of course Spring Boot is cool, but with really simple steps you can start having the same in JavaEE world. 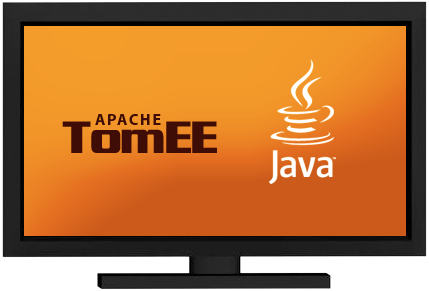 We (Apache TomEE contributors) are going to start to work on this and expand this idea. So don't underestimate Java EE because of Spring Boot. In previous post http://www.lordofthejars.com/2014/07/rxjava-java8-java-ee-7-arquillian-bliss.html we talked about microservices and how to orchestrate them using Reactive Extensions using (RxJava). But what's happen when one or many services fail because they have been halted or they throw an exception? 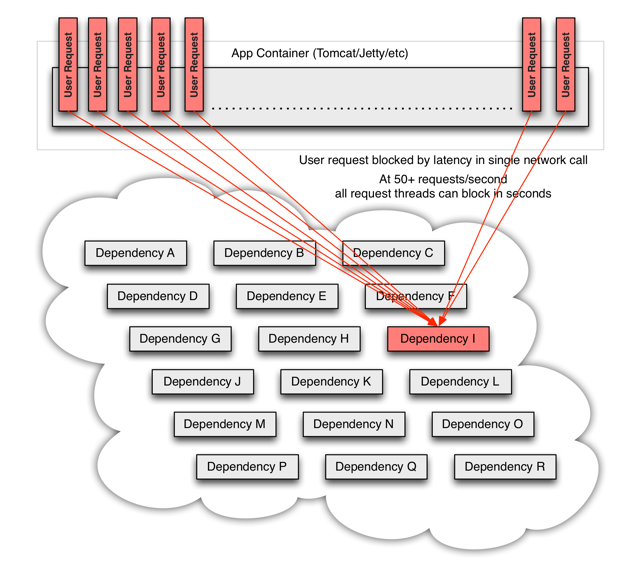 In a distributed system like microservices architecture it is normal that a remote service may fail so communication between them should be fault tolerant and manage the latency in network calls properly. And this is exactly what Hystrix does. Hystrix is a latency and fault tolerance library designed to isolate points of access to remote systems, services and 3rd party libraries, stop cascading failure and enable resilience in complex distributed systems where failure is inevitable. In a distributed architecture like microservices, one service may require to use other services as dependencies to accomplish his work. Every point in an application that reaches out over the network or into a client library that can potentially result in network requests is a source of failure. Worse than failures, these applications can also result in increased latencies between services. And this leaves us to another big problem, suppose you are developing a service on a Tomcat which will open two connections to two services, if one of this service takes more time than expected to send back a response, you will be spending one thread of Tomcat pool (the one of current request) doing nothing rather than waiting an answer. If you don't have a high traffic site this may be acceptable, but if you have a considerable amount of traffic all resources may become saturated and and block the whole server. The way to avoid previous problem is to add a thread layer which isolates each dependency from each other. 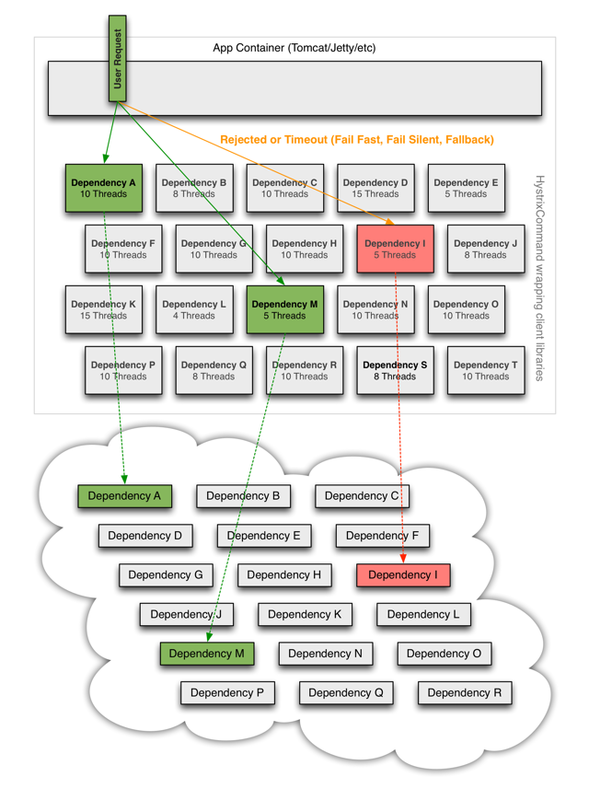 So each dependency (service) may contain a thread pool to execute that service. In Hystrix this layer is implemented by HystricxCommand object, so each call to an external service is wrapped to be executed within a different thread. Each thread has a timeout so a call may not be infinity waiting for a response. Perform fallbacks wherever feasible to protect users from failure. Measure success, failures (exceptions thrown by client), timeouts, and thread rejections and allows monitorizations. Implements a circuit-breaker pattern which automatically or manually to stop all requests to an external service for a period of time if error percentage passes a threshold. And then we can execute that command in a synchronous way by using execute method. Although this command is synchronous, it is executed in a different thread. By default Hystrix creates a thread pool for each command defined inside the same HystrixCommandGroupKey. In our example Hystrix creates a thread pool linked to all commands grouped to HelloWorld thread pool. Then for every execution, one thread is get from pool for executing the command. In fact synchronous calls are implemented internally by Hystrix as return new HelloWorldCommand().queue().get(); internally. We have seen that we can execute a command synchronously and asynchronously, but there is a third method which is reactive execution using RxJava (you can read more about RxJava in my previous post www.lordofthejars.com/2014/07/rxjava-java8-java-ee-7-arquillian-bliss.html). But sometimes things can go wrong and execution of command may throw an exception. All exceptions thrown from the run() method except for HystrixBadRequestException count as failures and trigger getFallback() and circuit-breaker logic (more to come about circuit-breaker). Any business exception that you don't want to count as service failure (for example illegal arguments) must be wrapped in HystrixBadRequestException. A method to do something in case of a service failure. This method may return an empty, default value or stubbed value, or for example can invoke another service that can accomplish the same logic as the failing one. Some kind of logic to open and close the circuit automatically. The method that is called when an exception occurs (except for HystrixBadRequestException) is getFallback(). You can override this method and provide your own implementation. Circuit breaker is a software pattern to detect failures and avoid receiving the same error constantly. But also if the service is remote you can throw an error without waiting for TCP connection timeout. Suppose next typical example: A system need to access database like 100 times per second and it fails. Same error will be thrown 100 times per second and because connection to remote Database implies a TCP connection, each client will wait until TCP timeout expires. So it would be much useful if system could detect that a service is failing and avoid clients do more requests until some period of time. And this is what circuit breaker does. For each execution check if the circuit is open (tripped) which means that an error has occurred and the request will be not sent to service and fallback logic will be executed. But if the circuit is closed then the request is processed and may work. Hystrix maintains an statistical database of number of success request vs failed requests. When Hystrix detects that in a defined spare of time, a threshold of failed commands has reached, it will open the circuit so future request will be able to return the error as soon as possible without having to consume resources to a service which probably is offline. But the good news is that Hystrix is also the responsible of closing the circuit. After elapsed time Hystrix will try to run again an incoming request, if this request is successful, then it will close the circuit and if not it will maintain the circuit opened. In next diagram from Hystrix website you can see the interaction between Hystrix and circuit. Now that we have seen the basics of Hystrix, let's see how to write tests to check that Hystrix works as expected. Last thing before test. In Hystrix there is an special class called HystrixRequestContext. This class contains the state and manages the lifecycle of a request. You need to initialize this class if for example you want to Hystrix manages caching results or for logging purposes. Typically this class is initialized just before starting the business logic (for example in a Servlet Filter), and finished after request is processed. Let's use previous HelloWorldComand to validate that fallback method is called when circuit is open. And the test. Keep in mind that I have added a lot of asserts in the test for academic purpose. This is a very simple example, because execute method and fallback method are pretty simple, but if you think that execute method may contain complex logic and fallback method can be as complex too (for example retrieving data from another server, generate some kind of stubbed data, ...), then writing integration or functional tests that validates all this flow it starts having sense. Keep in mind that sometimes your fallback logic may depends on previous calls from current user or other users. Hystrix also offers other features like cashing results so any command already executed within same HystrixRequestContext may return a cache result (https://github.com/Netflix/Hystrix/wiki/How-To-Use#Caching). Another feature it offers is collapsing. It enables automated batching of requests into a single HystrixCommand instance execution. It can use batch size and time as the triggers for executing a batch. As you may see Hystrix is a really simple yet powerful library, that you should take under consideration if your applications call external services. Let's see a really simple example. Suppose we have a booking shop where users can navigate through a catalog and when they find a book which they want to see more information, they click on the isbn, and then a new screen is opened with detailed information of the book and comments about it written by readers. One service to get book details. They could be retrieved from any legacy system like a RDBMS. One service to get all comments written in a book and in this case that information could be stored in a document base database. The problem here is that for each request that a user does we need to open two connections, one for each service. Of course we need a way do that jobs in parallel to improve the performance. And here lies one problem, how we can deal with this asynchronous requests? The first idea is to use Future class. For two services may be good but if you require four or five services the code will become more and more complex, or for example you may need to get data from one service and using it in another services or adapt the result of one service to be the input of another one. So there is a cost of management of threads and synchronization. It will be awesome to have some way to deal with this problem in a clean and easy way. And this is exactly what RxJava does. RxJava is a Java VM implementation of Reactive Extensions: a library for composing asynchronous and event-based programs by using observable sequences. With RxJava instead of pulling data from an structure, data is pushed to it which reacts with an event that are listened by a subscriber and acts accordantly. You can find more information in https://github.com/Netflix/RxJava. So in this case what we are going to implement is the example described here using RxJava, Java EE 7, Java 8 and Arquillian for testing. This post assumes you know how to write Rest services using Java EE specification. And finally it is time to create a third facade service which receives communication from the client, sends to both services in parallel a request and finally zip both responses. zip is the process of combining sets of items emitted together via a specified function and sent it back to client (not to be confused with compression :)). Basically we create a new service. In this case URLs of both services we are going to connect are hardcoded. This is done for academic purpose but in production-like code you will inject it from a producer class or from properties file or any system you will use for this purpose. Then we create javax.ws.rs.client.WebTarget for consuming Restful Web Service. After that we need to implement the bookAndComment method using RxJava API. The main class used in RxJava is rx.Observable. 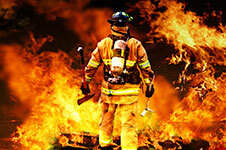 This class is an observable as his name suggest and it is the responsible of firing events for pushing objects. By default events are synchronous and it is responsible of developer to make them asynchronous. Basically we create an Observable that will execute the specified function when a Subscriber subscribes to it. The function is created using a lambda expression to avoid creating nested inner classes. In this case we are returning a JsonObject as a result of calling the bookinfo service. The result is passed to onNext method so subscribers can receive the result. Because we want to execute this logic asynchronously, the code is wrapped inside a Runnable block. Also it is required to call the onCompleted method when all logic is done. Notice that because we want to make observable asynchronous apart of creating a Runnable, we are using an Executor to run the logic in separate thread. One of the great additions in Java EE 7 is a managed way to create threads inside a container. In this case we are using ManagedExecutorService provided by container to span a task asynchronously in a different thread of the current one. Similar to previous but instead of getting book info we are getting an array of comments. Then we need to create an observable in charge of zipping both responses when both of them are available. And this is done by using zip method on Observable class which receives two Observables and applies a function to combine the result of both of them. In this case a lambda expression that creates a new json object appending both responses. Let's take a look of previous service. We are using one of the new additions in Java EE which is Jax-Rs 2.0 asynchronous REST endpoints by using @Suspended annotation. Basically what we are doing is freeing server resources and generating the response when it is available using the resume method. And finally a test. We are using Wildfly 8.1 as Java EE 7 server and Arquillian. Because each service may be deployed in different server, we are going to deploy each service in different war but inside same server. So in this case we are going to deploy three war files which is totally easy to do it in Arquillian. In this case client will request all information from a book. In server part zip method will wait until book and comments are retrieved in parallel and then will combine both responses to a single object and sent back to client. Moreover in this example we have seen only an example of connecting to two services and retrieving information in parallel, and you may wonder why not to use Future class. It is totally fine to use Future and Callbacks in this example but probably in your real life your logic won't be as easy as zipping two services. Maybe you will have more services, maybe you will need to get information from one service and then for each result open a new connection. As you can see you may start with two Future instances but finishing with a bunch of Future.get() methods, timeouts, ... So it is in these situations where RxJava really simplify the development of the application. Furthermore we have seen how to use some of the new additions of Java EE 7 like how to develop an asynchronous Restful service with Jax-Rs. In this post we have learnt how to deal with the interconnection between services andhow to make them scalable and less resource consume. But we have not talked about what's happening when one of these services fails. What's happening with the callers? Do we have a way to manage it? Is there a way to not spent resources when one of the service is not available? We will touch this in next post talking about fault tolerance. One of the great improvement in Java EE 5 and beyond it is the introduction of CDI (Context and Dependency Injection). CDI is used for injecting dependencies among a lot of other things like events, interceptors, … and can be used in POJOs. In some cases instead of injecting other objects (as a dependency injection), you want to inject a value from a properties file into a class that needs to be configured externally. Almost all projects you develop with Java EE will contain a persistence layer and probably you will use JPA for dealing with SQL systems. One way to get an EntityManager is using @PersistenceContext. In this post we are going to explore the advantages of injecting EntityManager instead of using PersistenceContext annotation. I have written the example and the explanation on github using Docstract. You can read on https://github.com/tomitribe/community/tree/master/injecting-entitymanager. Docstract is an small java project which reads a java source file, extracts the comments between /** and */ sequentially from all over the file and stores them inside an output AsciiDoc file. The idea is not new in fact it is from https://github.com/javaee-samples/javaee7-samples/ developed by Aslak Knutsen but instead of using Ruby and inside Awestruct, this project is written in java and it is run from CLI. This is a class which contains some comments to be processed. if include contains a java file, like first example, the whole class is read and inserted within AsciiDoc source code blocks. if include contains a java file but with # symbol, like second one, the right part of # will be used as method name of given class. So for example Project#setId(String, String) will include a method of Project's class called setId and receiving two string parameters. if include contains an xml file, the file is inserted "as is" within AsciiDoc source code block. if include contains an xml file and between brackets there is an xpath expression, the result of that expression will be inserted. any other include is left "as is", so it will be processed by AsciiDoc(tor) processor. Also note that the include files will be resolved relative from place where the CLI is being run, typically from the root of the project. You can use callouts inside java and xml code and the processor will render it in the proper way. In java you can write a callout as a single line comment with callout number between <, > at start. In xml you can write callouts between +xml+ comments and the callout number being the first word. And an AsciiDoc file will be generated from comments blocks. You can see an example at community Tomitribe examples with class: https://github.com/tomitribe/community/blob/master/mongodb-example/src/test/java/org/superbiz/nosql/mongodb/GreetingsSessionBeanTest.java and the rendered output: https://github.com/tomitribe/community/blob/master/mongodb-example/README.adoc. New features will be added when they are required but of course feel free to clone and improve it. @Resource annotation appeared for the first time in Java EE 5 specification. When you annotate an attribute with @Resource, it will be the container responsible of injecting the requested resource. The typical example is used with DataSource class. That's great and you can use it with JMS as well, but what's happening to NoSQL databases, would not it be perfect to do something similar for them? 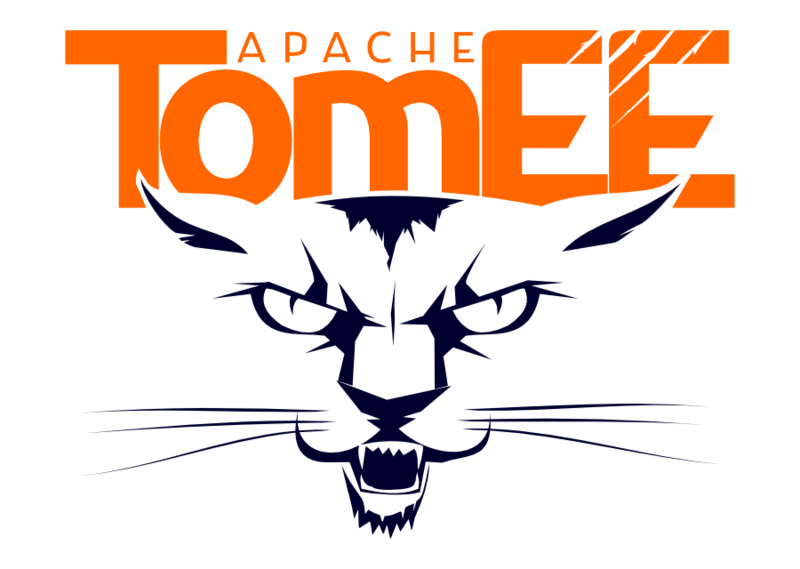 With Apache TomEE you can do it by providing your own @Resource provider class. In this post we are going to see how you write your own provider for MongoDB so you can use @Resource for MongoDB too. It is a simple POJO with a method which returns a MongoClient class (the base class for Java MongoDB driver), and setters with required parameters. Next step is creating a file called resources.xml in WEB-INF directory. In this file we configure TomEE so he knows about the provider/class. Notice that in this file you set the provider class and how the attributes are set. In fact you set them more or less like a properties file. So when you are are writing address 127.0.0.1, TomEE under the cover will call provider.setAddress("127.0.0.1"). The last thing to do is start using @Resource annotation with MongoDB. So in this case we are creating a MongoClient provider because TomEE requires a no parameters constructor, but MongoClient has parameters so we need to create a provider class with a method which returns the MongoClient instance to be used. where mongo is the id of the resources file and address the name of the field. So you can change each of the value in an easy way depending on the environment you are pushing. And that's an awesome thing. So now there is no excuses to not start treating NoSQL databases like SQL databases from the point of view of Java EE.